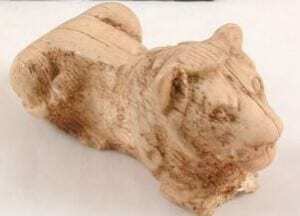 As to be expected, there are loads: lion headed gods, sphinx and lion hunt stories, however I am going to focus on a very particular ilk of lion, those represented in gaming pieces. Made of ivory, this time elephant; our hippo is safe, these pieces come from Abydos, found in the tombs of the courtiers (Tomb 787), one of the burials around the funeral enclosure of king Djer, so likelihood is there are rather special and unique objects. 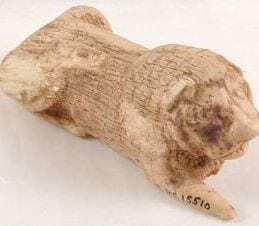 The bottoms were worn down to suggest sliding and the middle, where they are most weighted, is the most rubbed down indicating where they have been handled; they were perhaps gaming pieces (Petrie, Royal Tombs II, 23) for a lion and hare or lion and jackal type game (bit like backgammon but more fiddly). 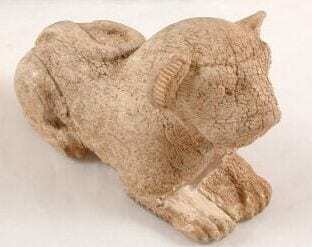 Lions denoted a certain grandness; having them involved in some form of board game could be a forerunner to the courtly game of chess, with the lions perhaps representing the king or noblemen. It can be taken for granted that these lions would most certainly be recognised by the 19th century and early 20th century punters. Droves of art and literature have represented lions for centuries, most notably for heraldic means. A whole ‘lion code’ existed with which one could denote your family’s, or an individual, identity. Ranging from passant (aggressive up on two legs ready to strike) all the way to couchant, the more passive stance our chaps are adopting, lions were everywhere. The English coat of arms features three lions passant-guardant, meaning they have their two paws up, but are coquettishly looking out of the image, straight at the viewer. Even in Christianity the lion appears synonymous with representations of both Satan and God, as well as a common motif for Christian suffering. A bestiary belief of the Medieval lion was that they gave birth to dead young which needed to be ‘resurrected’ with their mother’s breath. Just in London, lions had been on display since the Medieval era, therefore their presence in London may have been far less of a novelty than that of our hippo. Our lions are as intricate as Japanese netsuke that may represent amusing gaming pieces or more astute political iconography. 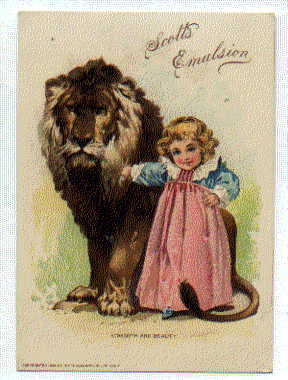 The Victorians would have recognised them as lions instantly, perhaps feeling a deeper level of connect with them as their own history and royal lineage had been so populated by these creatures. Hahn, 2004. The Tower Menagerie: The Amazing True Story of the Royal Collection of Wild Beasts offers a good history of the medieval lions in London, although it does get a bit repetitive after a while as they all die off.